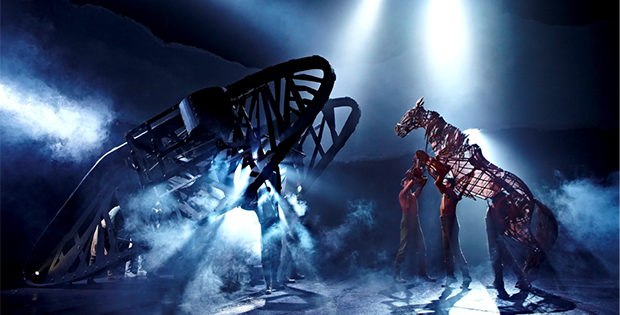 On February 27th 2014, National Theatre Live (NT Live) will broadcast War Horse live from the New London Theatre to cinemas across the world. The broadcast will be shown in Sony 4K at the Curzon Cinema in Chelsea, the theatre production will be projected using a Sony projector, ensuring cinema-goers enjoy the best possible 4K viewing experience. The recording will be available as a 4K DCP allowing many 4K enabled cinemas to also show encore screenings at a later date. Creative Broadcast Solutions (CBS), Technical Producer for NT Live, with NEP Visions, NT Lives long-term OB partner will work with Sony, using Sonys F55 Super CineAlta cameras equipped with Fujinon Cabrio lenses to capture the performance. NEP Visions will provide the technical infrastructure and expertise to take the 4K content from camera to satellite, as well as recording and broadcasting a simultaneous HD version. The cameras will feed 4K content into Sony BPU4000 fibre adapters which generate 4K and HD signals simultaneously, the feeds are then sent to a 4K capable vision mixer to create a live mix from the six camera feeds, adding graphics and subtitles (for the HD version only). Pre-recorded supplementary programme materials have been ingested onto a Sony media server to play in. The live mix is passed to the satellite service provider Links Broadcast. The mix feed is recorded on a Sony MasterDeck, both for archive and the creation of a 4K DCP master that will be sent to theatres around the world. NEP Visions will also record 4K ISOs onto two additional Sony MasterDecks for later use. As well as the groundbreaking 4K presentation, NEP Visions will provide a simultaneous live HD feed for distribution by Links Broadcast to over 1000 cinemas worldwide in line with NT Lives existing programme of broadcasts. Links Broadcast will provide the satellite uplink and downlink facilities to enable the delivery of the War Horse 4K signal from the New London Theatre in to the Curzon Cinema in Chelsea. The Links Broadcast 4K uplink will operate alongside Links HD uplink facility and will enable the encoding of the incoming 4K content. Using four synchronous Adtec EN-100 encoders the incoming signal is combined in to a single transport stream via an Adtec DTA3050 multiplexor for onward transmission via a 1.5m antenna on Links Broadcasts 4K uplink vehicle. The 4K signal will be uplinked on to SES Astras 3B satellite using 36Mhz of capacity in order to achieve the maximum possible video data rate within the modulated 4K transport stream. The incoming signal will be downlinked at the Curzon cinema in Chelsea via a 1.8M Links Broadcast receive antenna which will be fed in to Adtec RD70 receiver decoders and will be delivered to Sonys 4K cinema facility for the projection. Decoded 4K pictures will be fed directly to Curzon Chelseas Sony projector, with four times the detail of 2K or conventional HD television pictures, Sony 4K brings audiences unmatched levels of immersive detail and realism. Based on the novel by Michael Morpurgo, War Horse is the powerful story of a young boy called Albert and his beloved horse, Joey, who has been requisitioned to fight for the British in World War I. Caught in enemy crossfire, Joey ends up serving on both sides during the war before landing in No Mans Land, while Albert, not old enough to enlist, embarks on a treacherous mission to find his horse and bring him home. A remarkable tale of courage, loyalty and friendship, War Horse features ground-breaking puppetry work by South Africas Handspring Puppet Company, which brings breathing and galloping horses to life on stage, seen by over 4 million people worldwide the broadcast of War Horse will be seen in over 1000 cinemas in more than 30 countries. Emma Keith, Producer, NT Live, commented, NT Live is delighted to be at the forefront of this new technology and to continue being at the cutting edge of live broadcast, particularly with our production of War Horse, which at its heart is a show which involves some spectacular puppetry an art form which is thought to have originated over 5000 years ago. Chris Bretnall from Creative Broadcast Solutions commented, We are proud to have been integral with the NT Live broadcasts from the outset, CBS are tremendously excited to continue to exploit the latest in emerging technologies to achieve the best possible experience for the cinema audiences. Brian Clark, Commercial & Technical Projects Director, NEP Visions commented, NEP Visions is delighted to be involved in the ground breaking event that is the National Theatres hugely prestigious project, War Horse, being broadcast live in 4K. This project is part of NEP Visions continuing push for innovation in developing areas of technology, to support our production partners and remain at the cutting edge of TV. David Bush, Head of Marketing at Sony Professional, Sony Europe added, At the heart of Sony DNA is the will to push technological boundaries always further. Being able to demonstrate, with the help of partners, a worldwide first live 4K workflow from stage to screen, on a project as well loved and renowned as War Horse, represents a true milestone in the development of 4K technology. Rob Wickings, Managing Director, Links Broadcast, This is a most exciting development in broadcast technology and in live satellite transmission in particular, and Links Broadcast are proud to be working with the National Theatre and its other technical partners on this revolutionary project which builds upon our existing experience in delivering major live events.